Click on the image to take you to Google Drive where you can download the PDF. In case you want some blank tags. 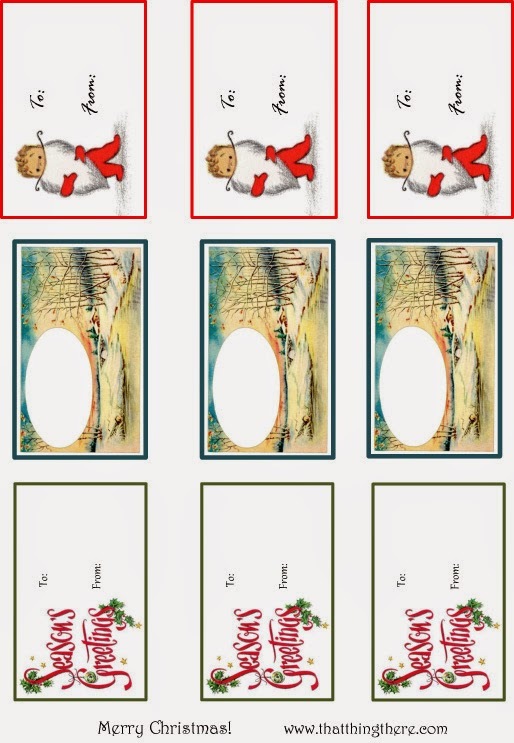 I had some extra room so I put in ovals you can use for tags or glue on an envelope. For more tags from last year, please click on this sentence! If you would like a sheet of just one style, just let me know and I'll whip one up! Enjoy! This wasn't really taken on the Winter Solstice but pretty close. It was taken last year on December 27. 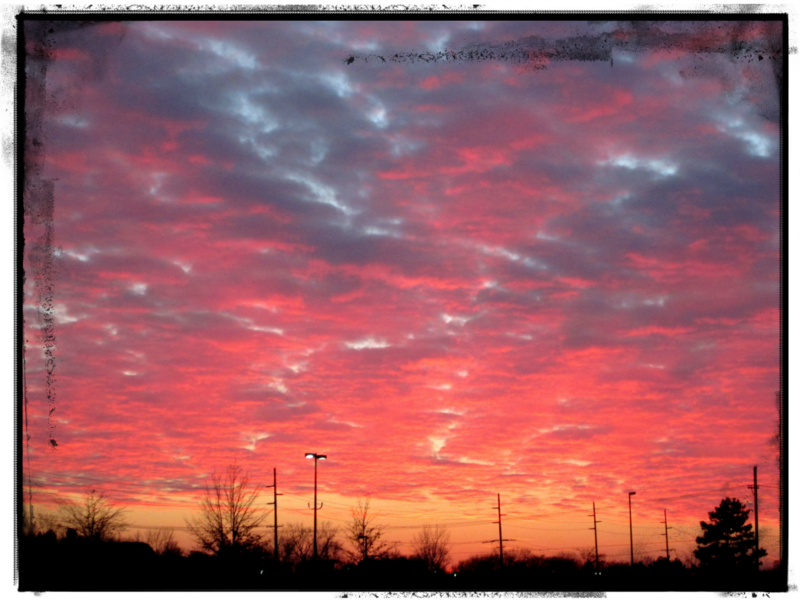 I was leaving a Big Lots when this gorgeous sunset about knocked me out. You don't need to be out in the middle of nowhere to appreciate nature. Its beauty is all around us wherever we are. Advances in science, industry, medicine and nearly every other area of human enterprise resulted from the influx of light. The only casualty was darkness, a thing of seemingly little value. But that was only because we had forgotten what darkness was for. In times past people took to their beds at nightfall, but not merely to sleep. They touched one another, told stories and, with so much night to work with, woke in the middle of it to a darkness so luxurious it teased visions from the mind and divine visitations that helped to guide their course through life. Please go and read the whole article (it's an op ed piece). It's not long at all and is written beautifully. I found this wonderful time-lapse video by Taro Nakai of the Winter Solstice sun's path in the Fairbanks, Alaska sky. Pay reverence to the darkness tonight. 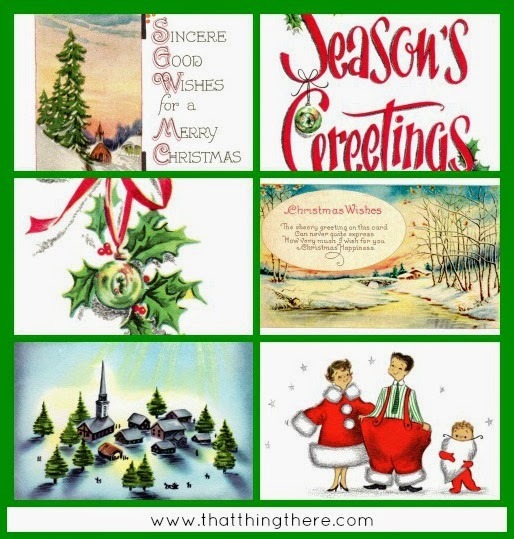 If you need some images for Christmas tags, cards, place cards, etc., here are some post card and card images from my personal collection. Please have fun using them for your personal projects! The following were created after 1923 and may or may not be covered by copyright. I offer them here for your enjoyment and inspiration. 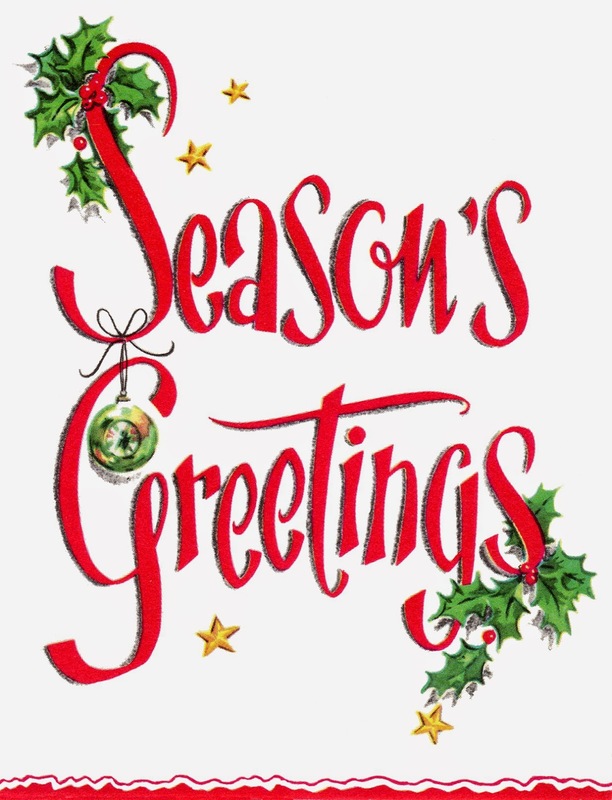 To see the images from last year, please CLICK HERE! Windows OS users: left click on the image and choose "Save image as ...", change the file name to something that makes sense to you and then save it your chosen file saving place. 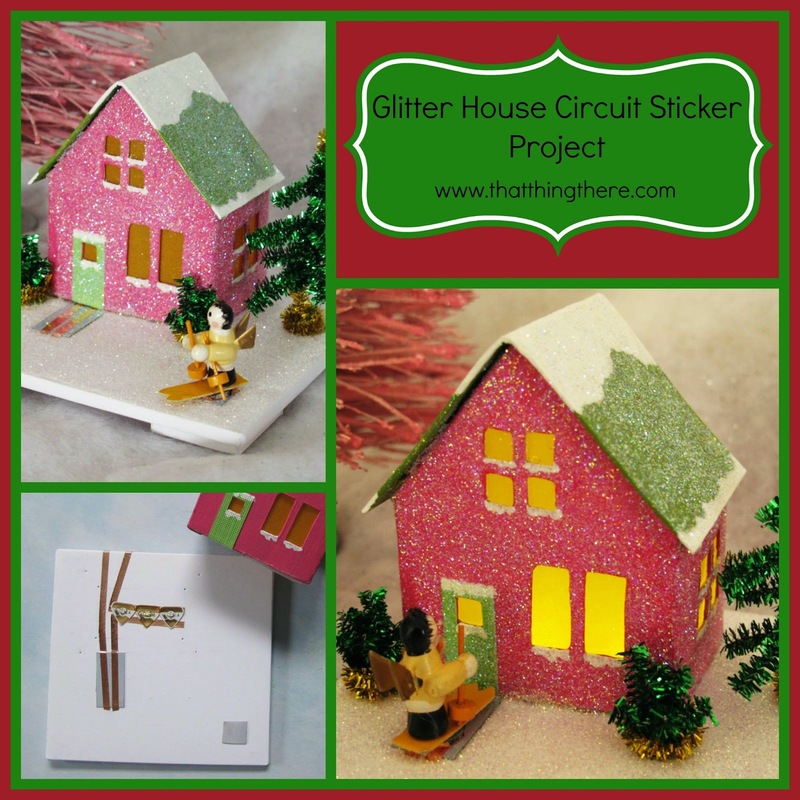 In my Glitter House Circuit Sticker tutorial, I said I would post how I made the tree and shrubs. This is it! These are the measurements I used for the shrubs in the picture. To be honest, the only measurements that are dead on accurate are for the gold piece and the two large green pieces. The five smaller pieces I cut by eye. You want them smaller than the two larger pieces, somewhat staggered in length. You can always trim them once they're all together. Also, you can make your shrub bigger or smaller. I used a highlighting pen and wire for the first two pictures because it was just too hard to photograph with the pipe cleaner, it being all fuzzy and shiny. You need to pretend the highlighting pen is a pencil and the wire is the pipe cleaner. Wrap the gold pipe cleaner around a pencil. Then tuck in/wrap the two end pieces to hold the ring together. Stuff the green pieces through the ring. Put the two larger pieces in first and the smaller pieces around them. Push them about half way through the ring. Make sure even the small pieces are coming through, even if just a little bit. Now, carefully and slowly, push all the pieces up so that they are level with the bottom of the gold ring. With your thumb on the bottom, press the green pieces down to make sure the smaller pieces aren't "floating" but making contact with your thumb. This is so all the pieces will be glued in place. You can try and rearrange the pieces at this point but they'll probably all fall out. It's better to glue it down first and the "fluff" the piece by moving the "branches" around. It is supposed to be a natural object after all, so variation is encouraged. Using hot glue,you can either glue the piece directly on your Glitter House base or glue it onto wax paper or one of those silicone craft sheets. The wax paper will leave a bit of paper residue on the glue but you won't see it. The only advantage of gluing it together first is if you want a lot of shrubbery and don't want to risk them falling apart while you're landscaping (if you knock it on the floor, the cat starts to play with them, etc.). Once again, these are the measurements I used for the tree in the picture. I forgot to put in another three inch gold piece for the base. 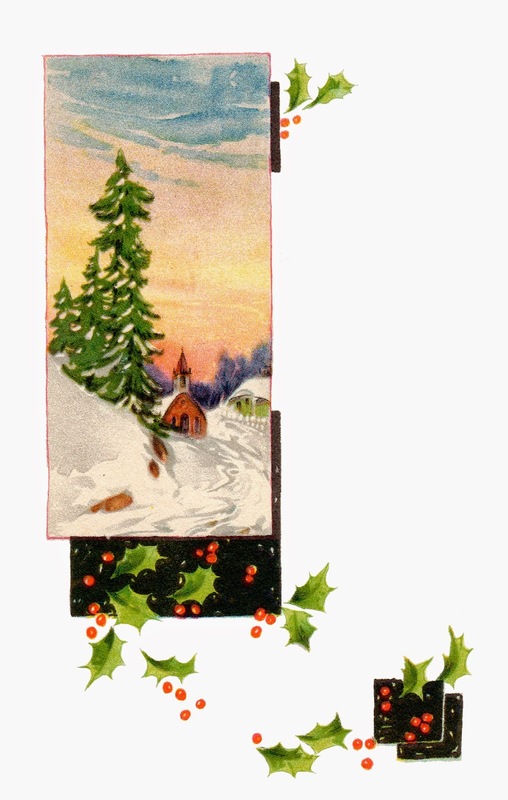 You may want your tree taller or shorter or with more branches. Start with the longer green pieces and wrap around the gold "trunk." Continue wrapping the other pieces opposite each other. Keep it flat for now so you don't drive yourself crazy. Push the branches down so they're closer together. Continue adding branches (and pushing down as much as you can to condense them) until you have as many branches as you want. Move the branches around in a pleasing shape. You can either leave a little gold at the top or trim it even with the branches. I left a little gold at the top and then curved it around with needle-nose pliers (you could use your fingers). It made me think of a star on top of the tree. Although not shown in the picture, this is when you can trim the branches so it makes the tree shape that you want. This is where the gold piece I forgot to include in the first picture comes in. 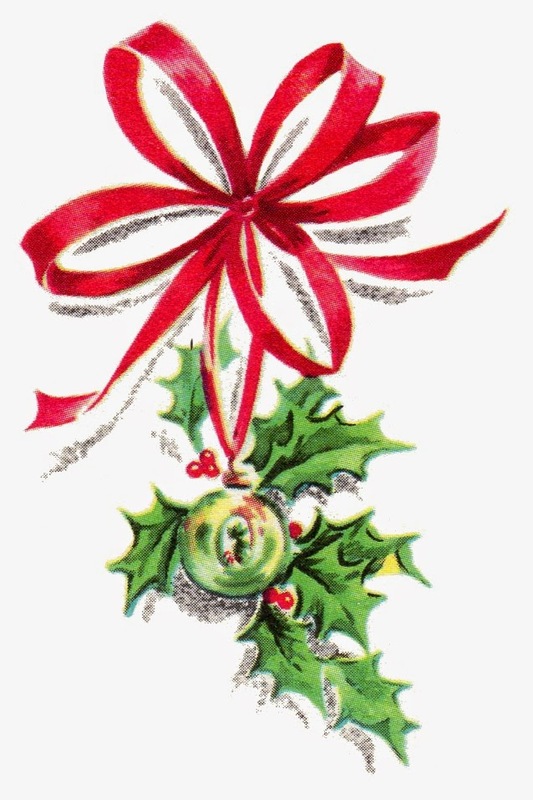 Wrap the piece around a pencil and tuck in the ends, like with the shrub piece. Stick the tree inside the ring. It won't be a tight fit but it gives some stability when gluing in place. 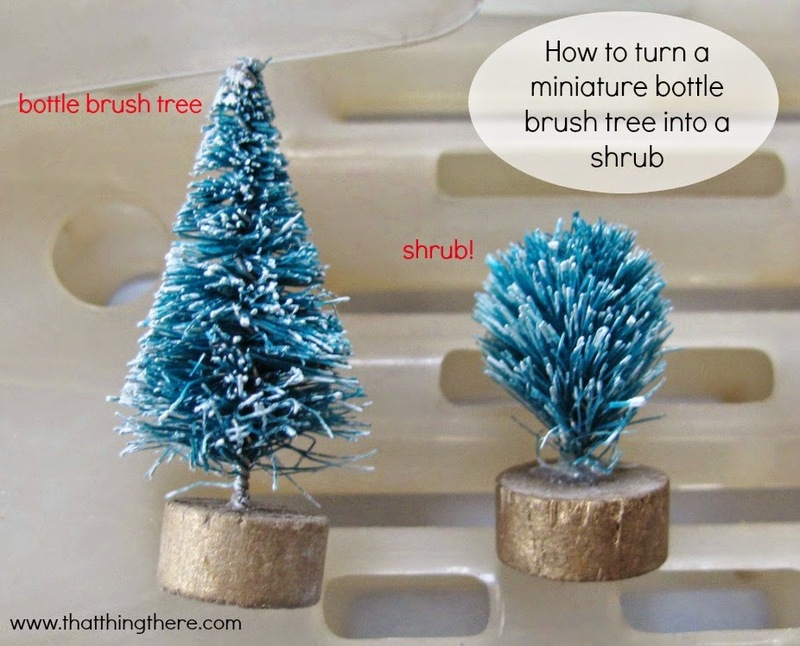 I don't remember exactly where I got my bag of miniature bottle brush trees. I'm sure it was from a craft store during their after-Christmas sale (get your supplies for next year!!!). Trim it into a pleasing shape. You may or may not need to add white paint on the tips. (I didn't in this picture.) If you do, why not add some glitter as well! I hope this helps and inspires you to landscape your Glitter House Project. If you come up with any clever adaptations or hacks of your own and would like to share, I would love to hear from you! Christmas is the season of sparkle and lights! 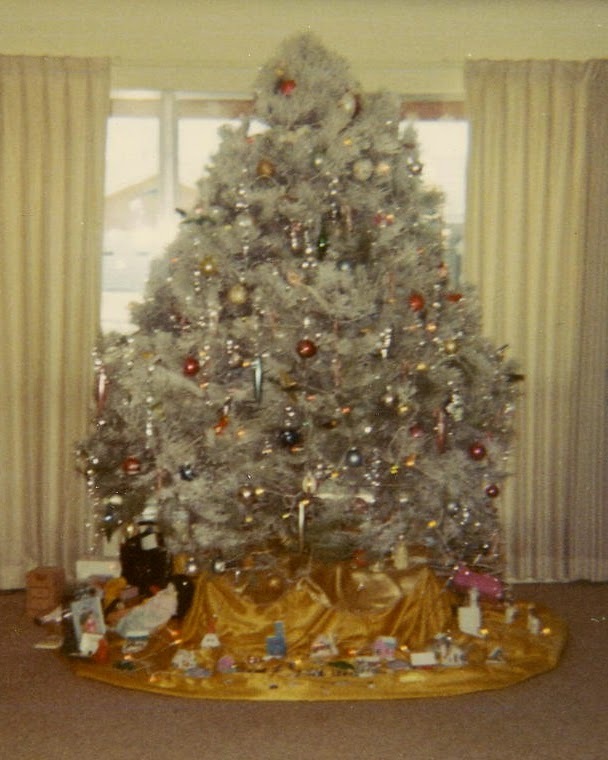 I grew up with glitter houses under the tree with little plastic or lead people milling about. I know you can't see them too well but they are under the tree in front. So, I thought a little bit of nostalgia combined with the new technology of Circuit Stickers would make a great combination. If you don't know what Circuit Stickers are, please peruse the Chibitronics website to learn more about this wonderful product! All I'll say here is that they are LEDs on stickers. Slap them on some copper tape, add a battery and you can easily add light to a project! First, a few warnings about this tutorial. WARNING 1: This is a looooong tutorial. It's not that the project is complicated, but I like to include a lot of pictures as my verbal skills sometimes lack. I also like to give alternatives and that adds to the length. WARNING 2: The order presented is just a guide. My process of doing things may not be the same as yours. If, as you're reading, think, "I'd do it differently", please, follow your own sensibility. WARNING 3: There is a whole lot of glitter involved. Lots. There will be glitter everywhere. Probably until July. Maybe longer. 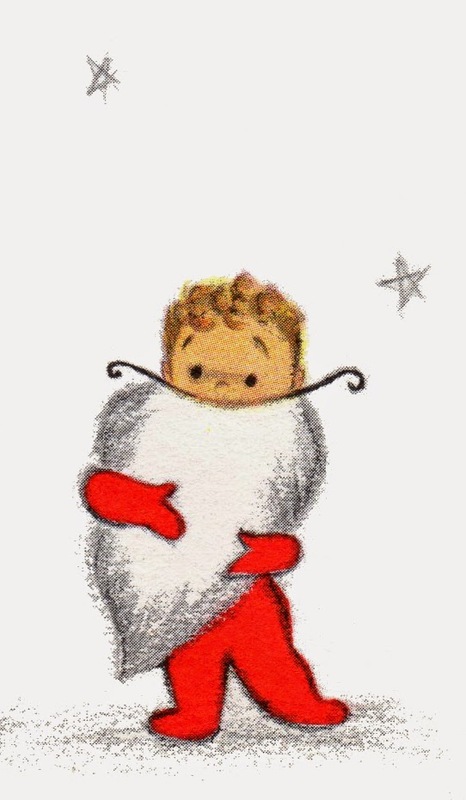 However, the lint collected from your dryer will be festive. WARNING 4: I'm assuming you have some knowledge of a basic circuit and how Circuit Stickers work. If you don't, this is a short video on Chibitronics website that explains it. Also, I'll be referring you to Jie Qi's quintessential paper battery holder and tutorial when that step comes up because 1) it would make a long tutorial even longer if I added it in and 2) she really has the quintessential template and tutorial. The basic concept of this project is the use of a "visitor" to the house that acts as a switch to complete the circuit and turn on the lights. small figurine somewhat in proportion to house (for "visitor") I used a mini ornament with the string cut off. 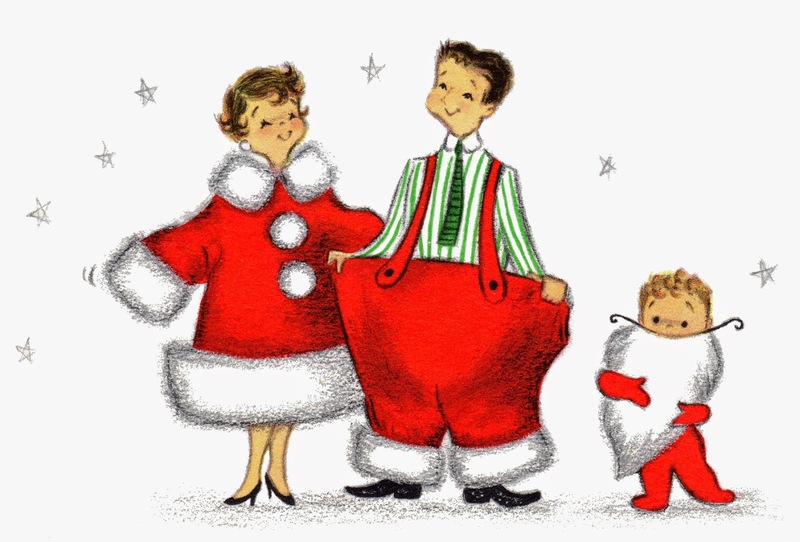 Look around your house and see if you have any little toy or ornament that could fit. Click on the above picture to download the template to make the house. 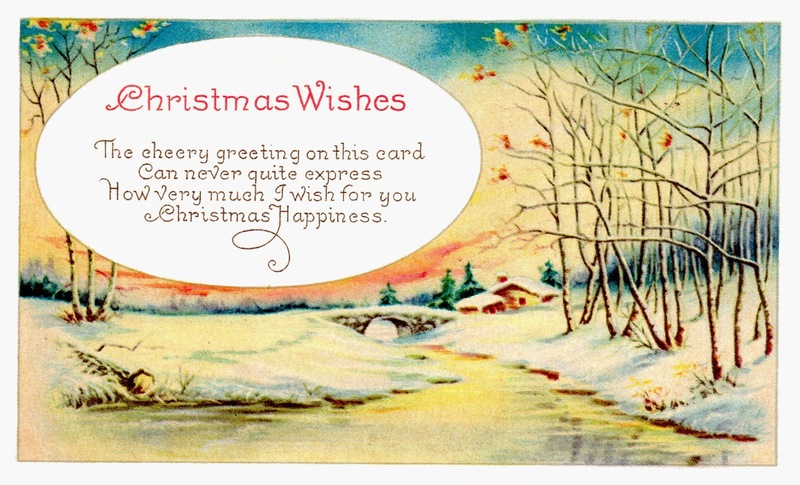 A word of thanks and praise goes to Howard Lamey of Little Glitter Houses. I adapted this pattern from his tutorial (which can be seen here) with his permission. Please, please, please, grab a beverage and go to his incredible website. There are tutorials of all sorts, patterns you can download and pictures that will inspire and delight you. 1. 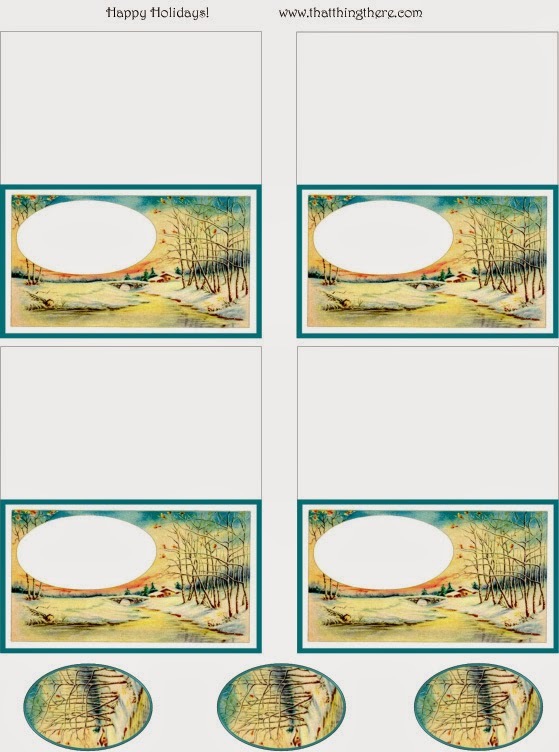 Download and print template. Printing on heavier paper, like cardstock, may be a bit better but not necessary. 2. Transfer template to chipboard. Tape the template onto chipboard using painter's, masking or sticky tape that you applied to your clothing and then pulled off a couple times. Why? It picks up lint and makes it less sticky so you can take it off without ripping the paper and/or chipboard. You can see the first cuts I did with a dull blade. You'll know it's dull if it pulls and tears the paper. I painted the inside of the house with two coats of white. I did it for better light reflection. I may or may not be right with this hypothesis. Therefore, I'm making this step optional. Go with your gut. I did a base coat of white before painting two coats of color. Again, I did no tests to determine if it affected the brightness of the color but that's what I did. While it's true you could use a blow dryer to dry your paint, and I did that for my first coats, it's probably best that you let the final coat dry naturally. Even if you use a dryer for all the coats, you still need to do the following things. Use the paper template to cut out paper for the windows. You can just eyeball the dimensions. They don't need to be all that precise but you do need enough excess around for the glue or double stick tape. Make the base for the house. I used foam core for my house because I had some already. 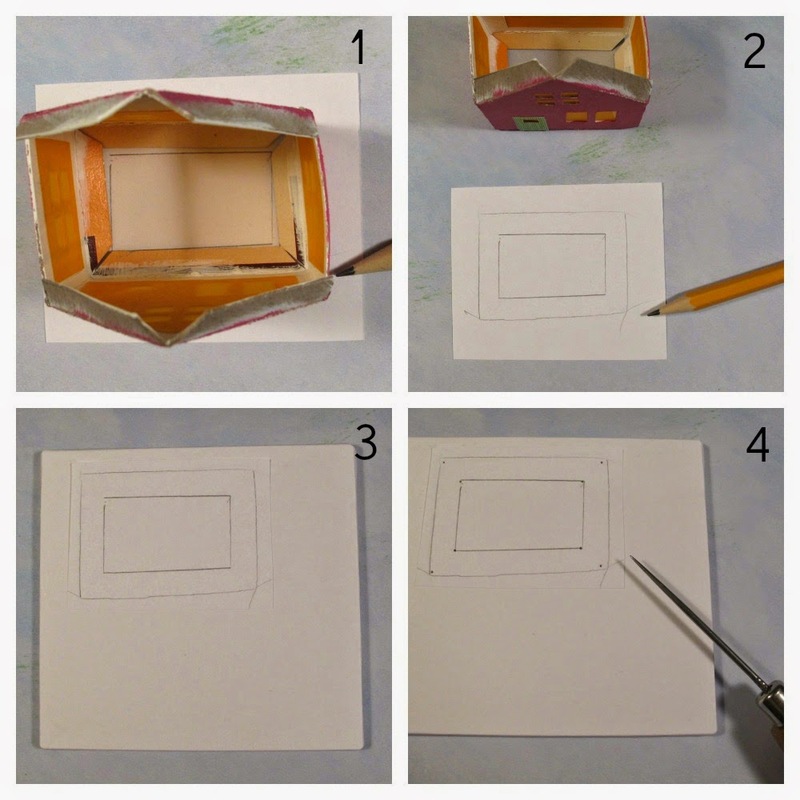 If you don't have foam core, use two pieces of corrugated cardboard instead. The picture above are the dimensions of the foam core and the paper (copy paper) I used. Glue foam core/cardboard to the larger piece of paper. Miter corners the distance of the width of the foam core (or the two pieces of cardboard). Glue the smaller piece of paper on top. Optional but nice finishing feature: Tap on the corners with a bone folder or something stiff and flat. This rounds the corners a bit so they're not so pointy. P.S. 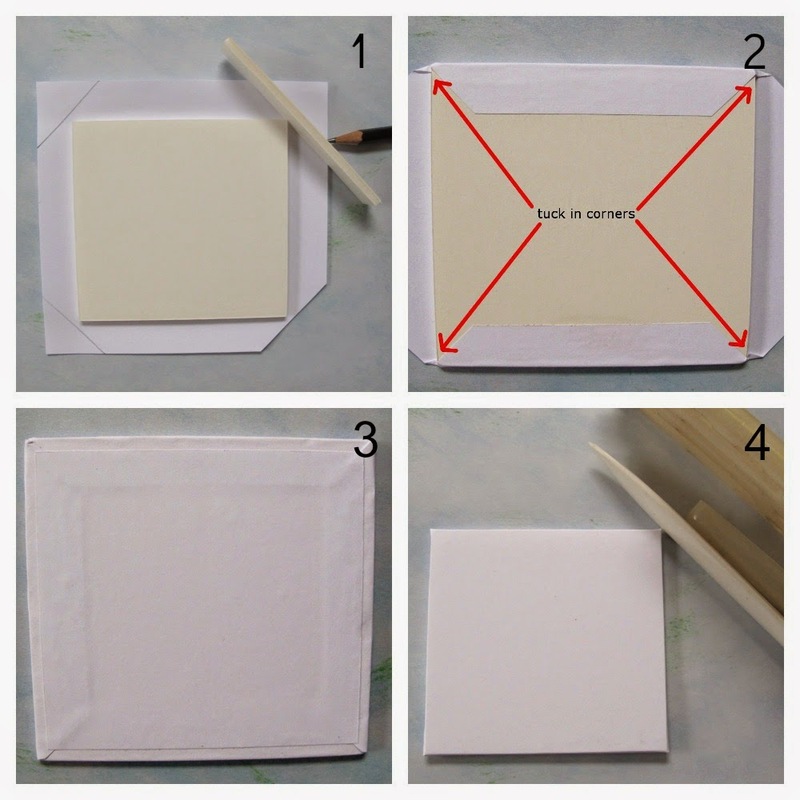 You now know how to cover book board if you want to make a book. 5. Adhere paper for windows and (not shown) door to the front of the house. Do this before gluing/taping house together otherwise you'll have to do what I did: swear a bunch and carefully take it apart. Note about door: you may need to trim it down a bit. Sorry about that. 6. Glue bottom of house together. You could also use double stick tape, if it's the heavy duty kind. Otherwise, you'll probably need to clamp it until the glue dries. You may want to touch up the corners with paint but the glitter hides a lot of flaws. And, yes, just do the bottom of the house for now. 7. Determine position of house on the base. OK, this is how I did it. You may think differently so do it how it feels right for you. I'm sure a big thing will be the use of awl pricks for placement. I'm coming at it from my book making classes where many times this was the method instead of using pencil marks. 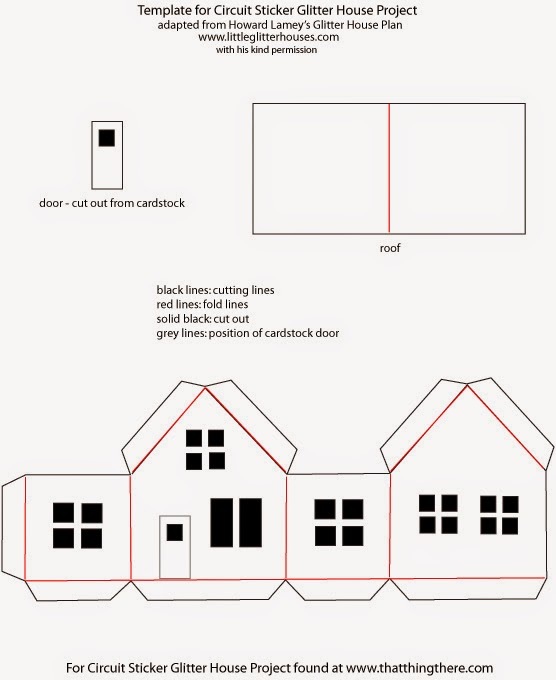 On scrap paper, draw around the outside perimeter of the house and the inside perimeter. You'll end up with a template like this. Position template on the base where it is most pleasing to you. Make awl pricks on the inside of the lines both for the outside perimeter and the inside perimeter. You want to make guidelines that are a bit smaller than the house so they are covered once you adhere the house to the base. Take the template off and lightly draw lines. These will be your guides when putting in the copper tape circuit. 8. Determine where your visitor will be completing the circuit. Set the house on the base where you drew the guide lines. Position where the visitor will need to be to bridge the open circuit. I put a awl prick, you can also mark it with a pencil. It doesn't need to be extremely precise. 9. Measure, cut and glue metal for switch. I made my piece slightly larger than the door and slightly longer than the mark I made in the previous step. My metal piece measured 1 x 0.5 inches but please go by your own measurements. I used E-6000 glue. Here is where I will refer you to Jie Qi's quintessential paper battery holder and copper tape circuit tutorial. Fabulous paper battery holder template. This video doesn't show the battery holder but it does show how to make the paths. Pre-fold the battery holder with the battery in place to give the paper "memory". To decrease waste of the copper tape, use a piece of string or yarn to measure how much you will need. Glue the battery holder in place last, after you've placed the copper tape. For the "strap" that holds the battery in, place glue on the tab and tuck it under with the battery in place so that you know it won't be too tight or too loose. Then, take the battery out, press to ensure adhesion and let dry. MAKE SURE THE TAPE AND STICKERS ARE ADHERED FIRMLY!! You are going to be using gobs of glitter so use a bone folder or the back of a spoon to make sure there are no gaps that the glitter can get under. A note on the amount of lights: my practice house had only two lights and it was fine. You really don't need three to illuminate the house. I don't know, maybe it's the more cowbell/goes to 11 syndrome but I wanted three lights. Try two lights and put your house on top of the lights (make sure to place the roof on top, it doesn't need to be glued) and see if you like it or not. 11. Cut flaps on bottom of house for circuit paths. Place house in position on the base (where your guidelines are) and mark where you need to cut. I actually used pencil marks this time. It's not a catastrophe but it is easier doing it the other way. 12. Adhere roof and paint snow. I used double stick tape for mine but was in a hurry and I ended up with small gaps. If you use double stick tape, take your time placing it and make sure it goes all the way to the edges of the flaps. I just free-formed it with the snow. I used two coats on the roof but just one with the windows. This just shows the back windows but I did the same with the rest of the windows. The roof snow placement is along the lines of the traditional glitter house. Feel free to do your own thing. Don't try to glitter the whole house at once. The glue will start to dry and you'll have a big mess. I did the roof first, then two sides of the house and then the other two sides. You'll want to use a white glue that dries clear. Elmer's glue will do this as well as many craft glues. Don't worry if you have white splotches when you first put on the glitter. It will dry clear and be pretty! once dry: no splotches, just pretty glitter! 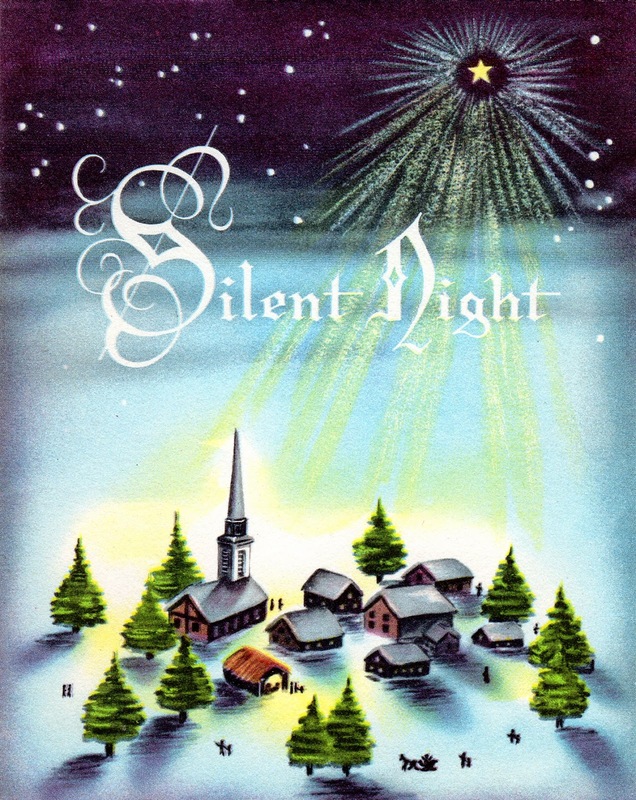 Tip: fold in half the sheet of paper that will be catching the excess glitter. This will give you a nice channel when pouring the glitter back into its container. This will not give you as sparkly a house as regular glitter. However, if you don't want the mess or perhaps there are respiratory issues but you still want some sparkle, you can use glitter glue. Wait, before you get all "She's crazy/mental/whacked/on drugs", let me explain. 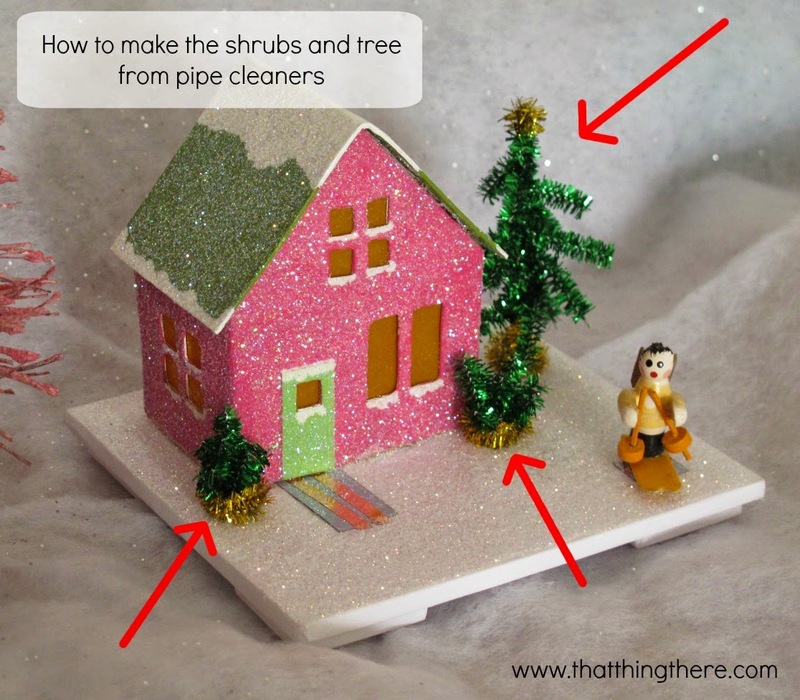 You can apply the glitter glue with a brush like paint. This is the result with cheap, old glitter glue that I had (and subsequently threw out, it was way too old). It's subtle and harder to photograph. The coverage is not as total as it is with regular glitter. Because of that, where there is just glue and no glitter, it's just shiny. I think I would have gotten better results with a better quality and newer bottle of glitter glue but, just to be clear, you will not get the same look as regular glitter. I'm just offering this alternative if you really don't want/can't use regular glitter. 14. Determine where the visitor will be "resting"
This will be the OFF position. It will hang out here until you move it onto the circuit to turn it on. Cut a piece of metal slightly larger than the magnet and glue in place. 15. Make feet for the base and adhere. Because the battery is on the underside of the base, you need something to raise it up so it can sit on your mantel/table/floor nicely. First, I would encourage you to look around your house and see if there's something fun you could use for the feet. I'm talking about old game pieces, beads, wood scrap, bottle caps, anything with two flat surfaces that can hold the weight of the base and house. I'm offering this component in case you don't. I used foam core again but you could use cardboard. You may only need one piece per foot but make sure you check it against the battery in its holder. It should be at least as thick to prevent wobbling. These are the dimensions of the foam core and paper I used. The smaller one is being placed next to the battery. Your dimension may vary depending where you placed the battery. Be sure to measure. Wrap the pieces the same way you did the base. You don't need a cover piece because you're gluing it onto the base. 16. Put glitter on the base. Double check to make sure the copper tape and Circuit Stickers are firmly adhered. Go over them again with a bone folder or the back of a spoon. Try to be careful when putting on the glitter so that you're not pouring the glitter directly over the circuit. I don't want you to freak out over this part, just be aware. If you have some gaps, like I have in this picture, wait until you put the house on to determine if you want to add more glue and glitter. You may not have to but if you do, just add a little more glue and glitter. Also, do not freak out when you see glitter where you don't want it, like on the circuit or the metal pieces. If I were smarter I could explain the physics of static electricity or whatever is happening. Just take a craft paint brush and brush it away. 17. Adhere the house on the base. Use the guidelines and adhere the house in place. I used hot glue because it adheres quickly. This is one circumstance I'm not all that sure double stick tape would work. There's just too much random glitter and I would be afraid it would hinder adhesion. This is just my unscientific opinion. 18. Do some yard work. Look around your house and see if there's anything you can use. (I'm a big proponent of using what you have.) It's your creation and your story so have fun with it. Take a moment to marvel at your lovely little house and how clever you are. Now make twenty more! Remember to visit Howard Lamey's Little Glitter Houses web site for inspiration on how to modify your house and different landscaping you can do! As always, if you have any questions, please send me an email with the fancy-pants widget on the right or in the comments. I would really love to see your own creations so please share your creativity with any website links (your own or a photo sharing site). If you would like to see other projects I have made using Circuit Stickers as well as with general paper and soft circuit techniques, please take a look at my Paper & Soft Circuits page. I am a procrastimaker. My love of making and learning to make things is rivaled only by my quest to organize my stash. Here is where I journal my work, ideas and inspirations of my many art and craft interests.